using some glass cullet I purchased on ebay! 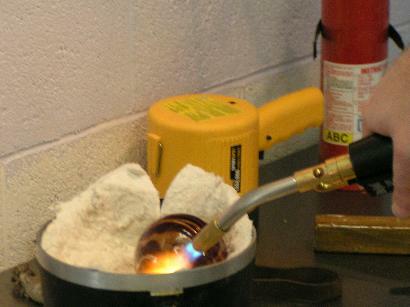 since glassblowing has the potential to cause serious personal injury! 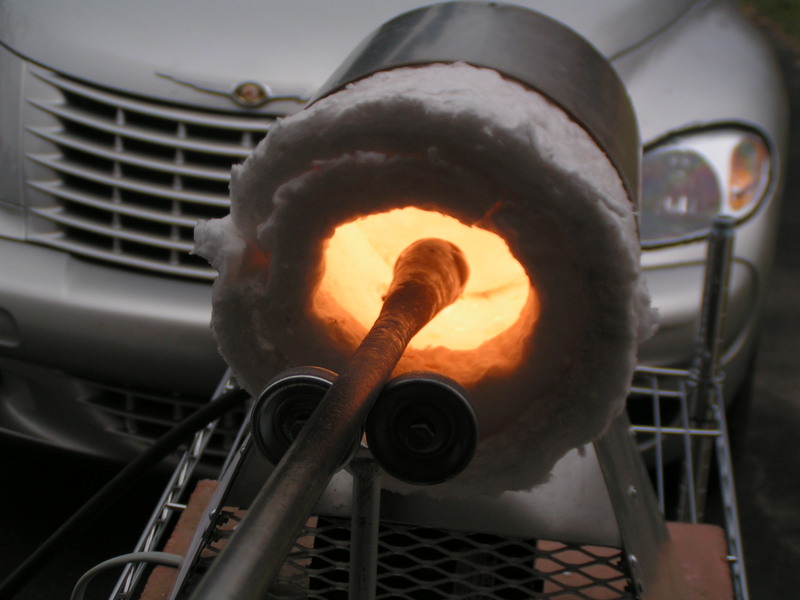 Pre-heat the blowpipe (a cold blowpipe will not pickup hot glass). 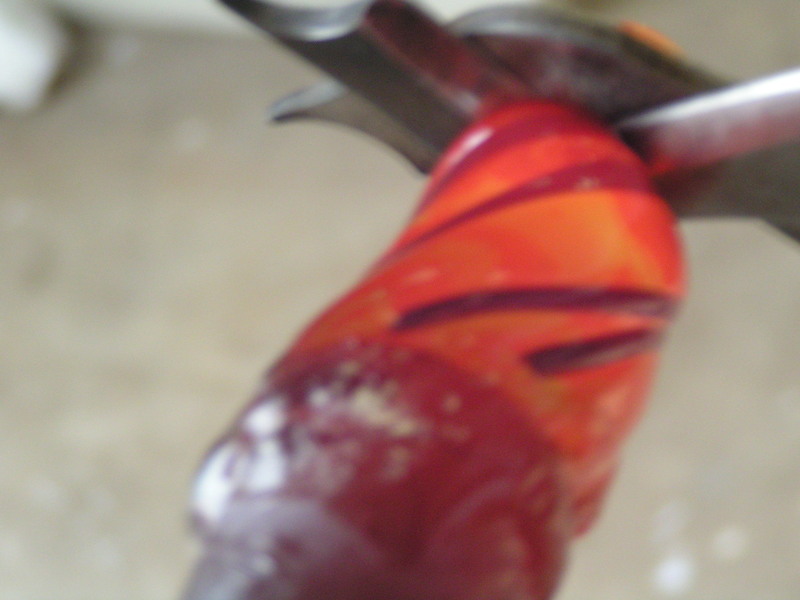 There is a tiny amount of glass (from the previous ornament) on the end of the blowpipe. 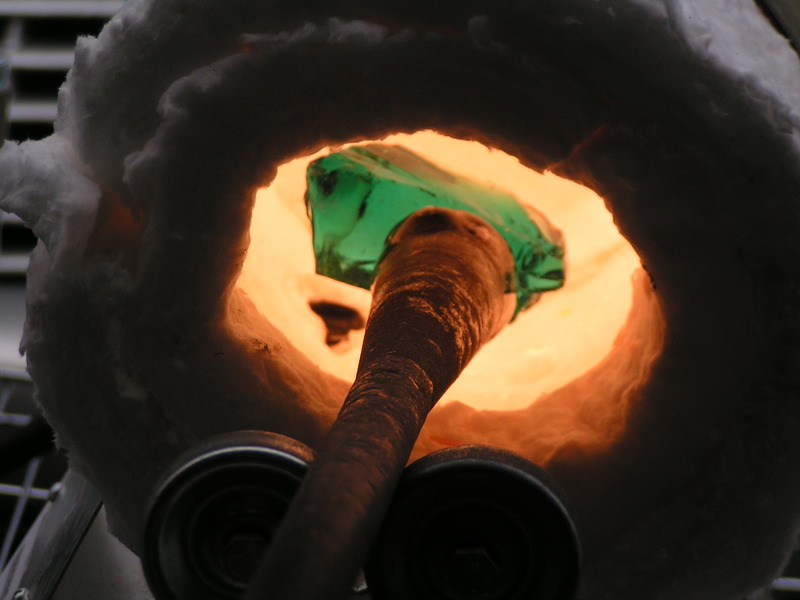 So, you ask, is there glass on the end of the blowpipe before picking up the first ornament? 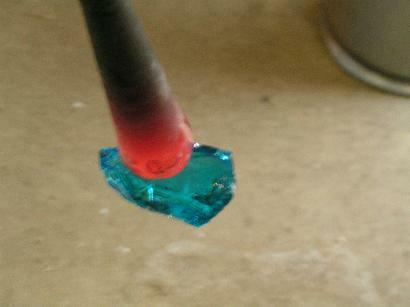 Yes, a small piece of scrap glass is pre-heated (with long-handled tongs) and placed on the end of the blowpipe. p.s. Although the car in the background looks like it is close to the back of the fire bucket, the car is actually quite a few feet away, it's just the way the camera brings everything into focus. 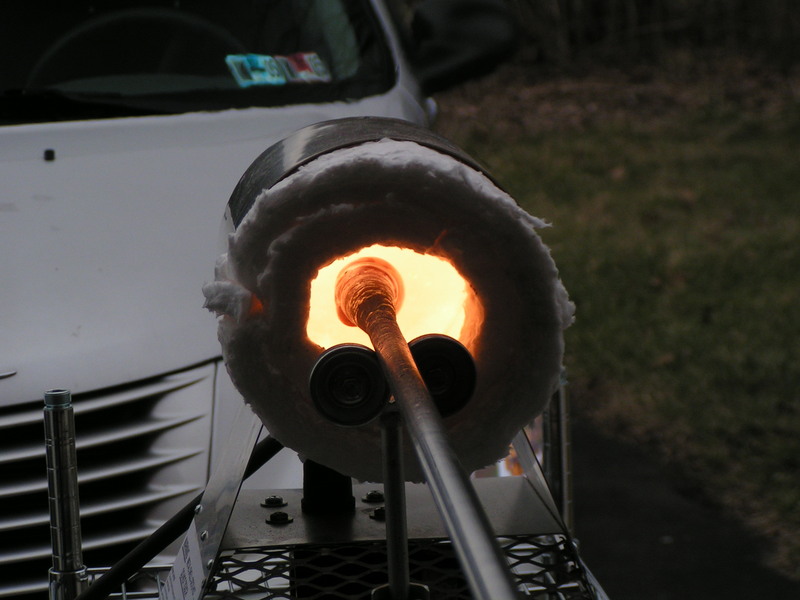 Pickup cullet from the kiln (at the annealing temperature of 950F). There is a metal wall placed in the kiln, dividing the kiln into two sections: a cullet section on the left third, and a finished ornaments section on the right two-thirds. Cullet is stuck on the end of the blowpipe. 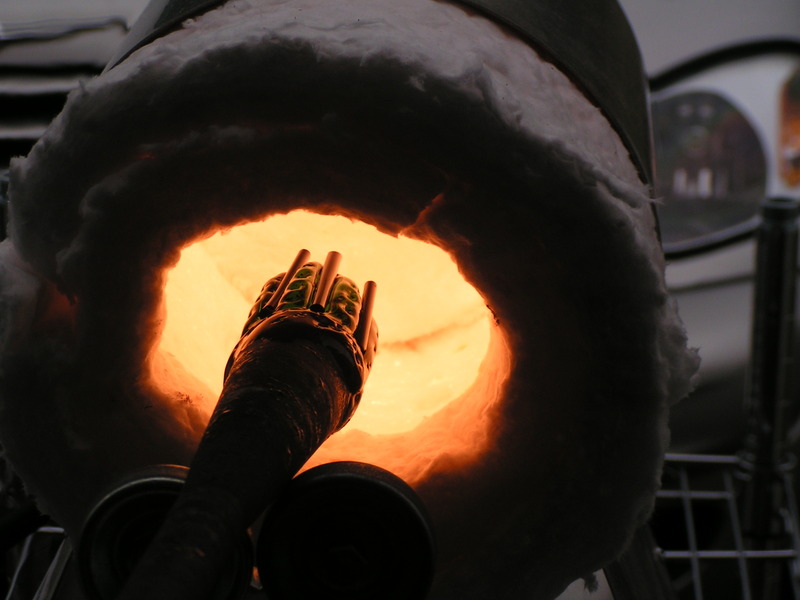 Although the cullet may look cold in this photo, the cullet temperature is 950F, and because of this, it will heat up quickly in the Fire Bucket. 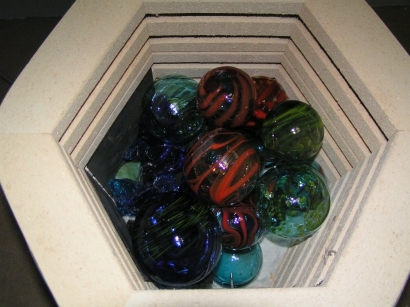 The pieces of cullet have been pre-selected both for color and weight. 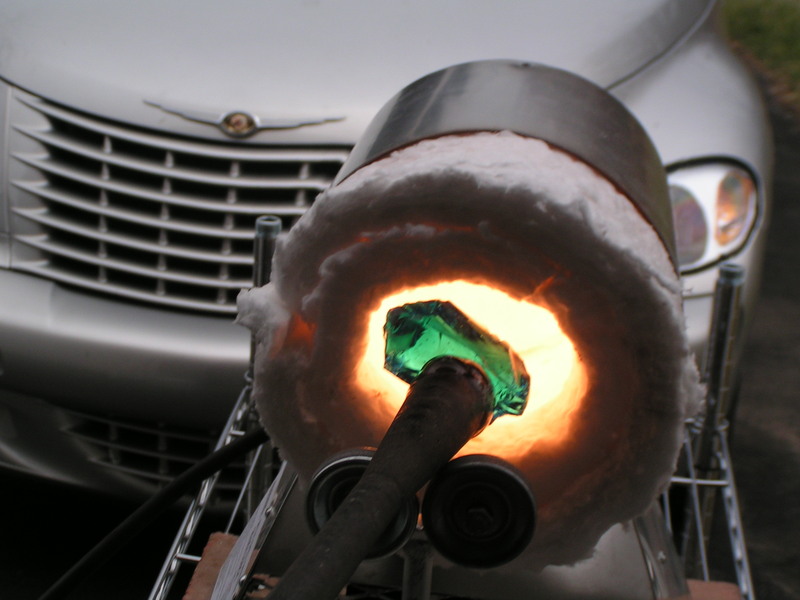 A finished ornament weighing between 90 grams = 3 ounces and 100 grams = 3.5 ounces will yield an ornament approximately 3" - 3.5" in diameter. 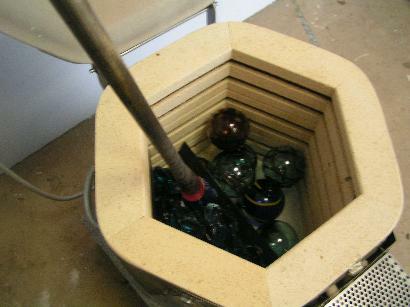 The cullet is heated in the fire bucket. At the beginning you see the edges are still sharp. I use a Steinert blowpipe with a 1.5" head, which is MUCH larger than the miniature tools normally used with a fire bucket (and more than twice as big as the 1" diameter blowpipes typically used by beginning students). 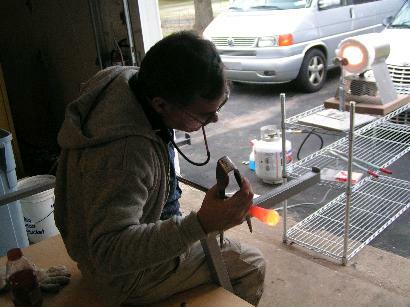 No, you don't need to use full-size glassblowing tools, but it is what I have, and what I know, and I think by doing it this way, you develop transferrable skills for working in a full-size "Hot Shop". The cullet begins to soften at the corners. The circular area shown in the lower left of the fire bucket is where the heated gas comes out. (and turning orange indicating that it is getting HOT). Once the cullet is soft, it needs to be marvered. "Marver" comes from the French word for "marble", and following this tradition, I use a piece of marble tile (one foot x one foot in size) I purchased at Home Depot for less than $2. 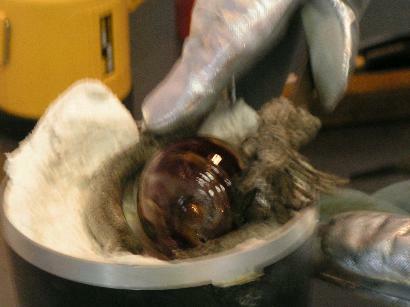 The marble seems resistant to the high heat of the molten glass. 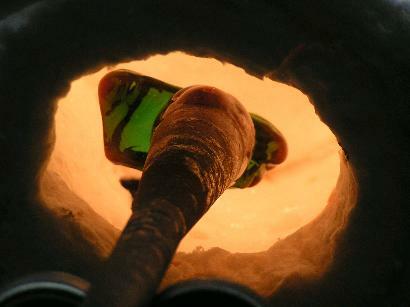 After marvering, the glass must be heated more in the fire bucket. 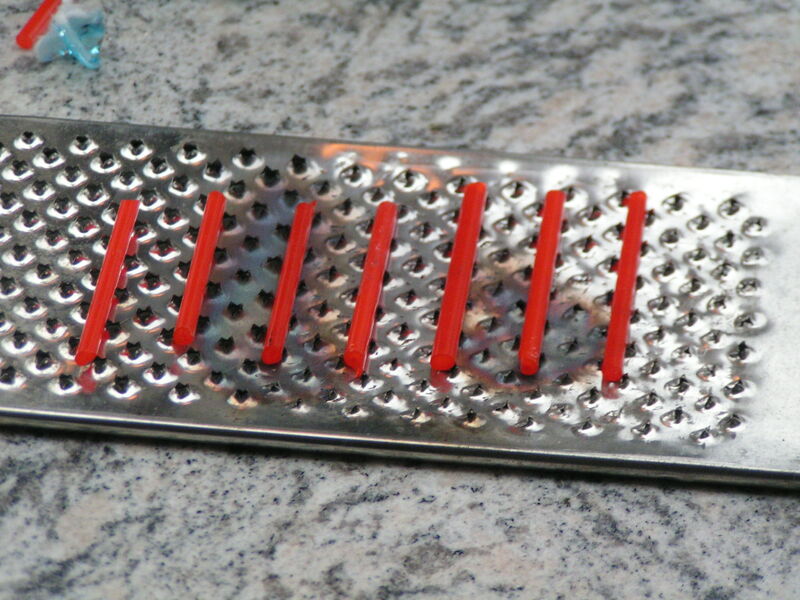 I have laid out 2" sections of cane (thin glass rods) on half of a cheese grater i purchased at a Dollar Store. 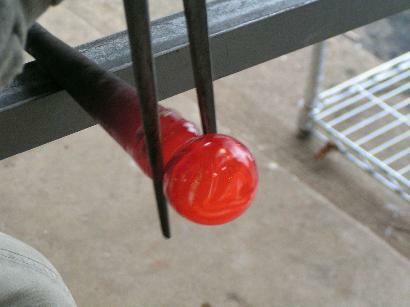 The metal grater not only resists the heat of the hot glass, but more importantly helps to evenly space out the cane, and keeps them from rolling around on the marver. Technically, my grater qualifies as a "cane marver"
I roll my glass right-to-left across the cane marver, picking up the sections of cane. 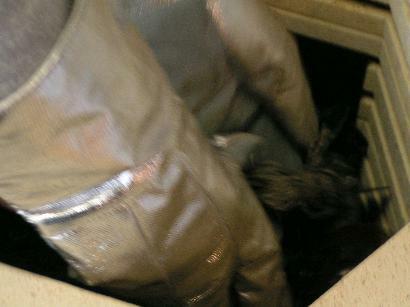 Then back into the fire bucket, to heat the cane into the cullet. 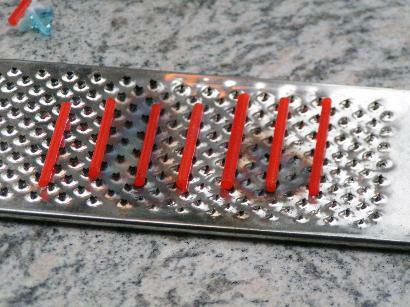 You can still see the dimples from rolling across the cheese grater! I've heated the cane so that it melted into the cullet, and the surface is now smooth from the marvering. 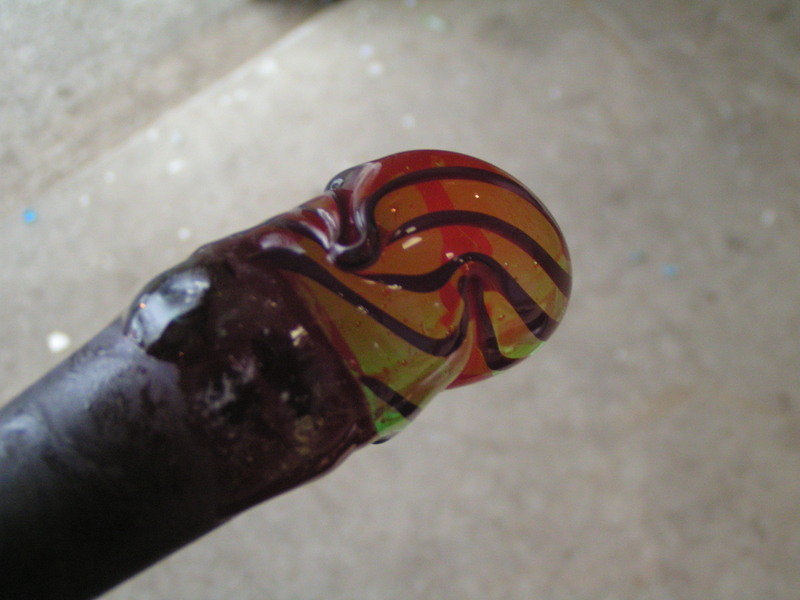 I now have a really nice twist on the cane, and this is done by placing the tip of the glass on the marver, and while the rest of the glass is hot, rotating the blowpipe, causing the glass to twist, as you can see here. 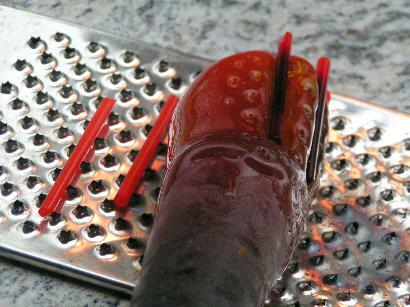 I then using a raking tool (an ice pick with the tip bent at a 90 degree angle will do), to "feather" the cane lines. 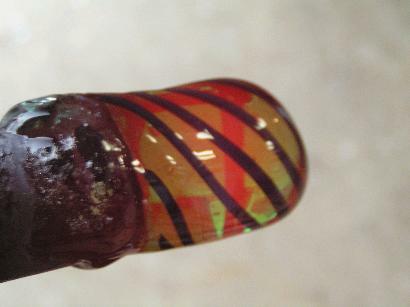 This is a technique used a century ago by Tiffany, and others. 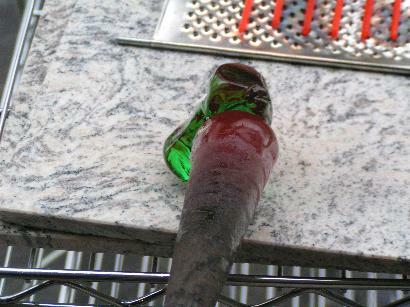 I've just taken the piece out of the fire bucket, and it is glowing hot! Once the glass is really hot, I can begin to blow air into the piece, to creat the first bubble. I use a Steinert blowhose to do this. I love my Steinert blow hose! 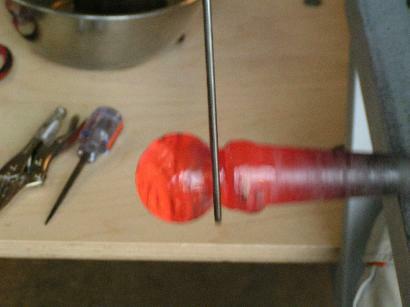 Using the Jacks, I begin to separate the piece from the blow pipe, by creating a Jack Line. In this photo, the bubble is so hot, you can't see the cane lines very much any more. 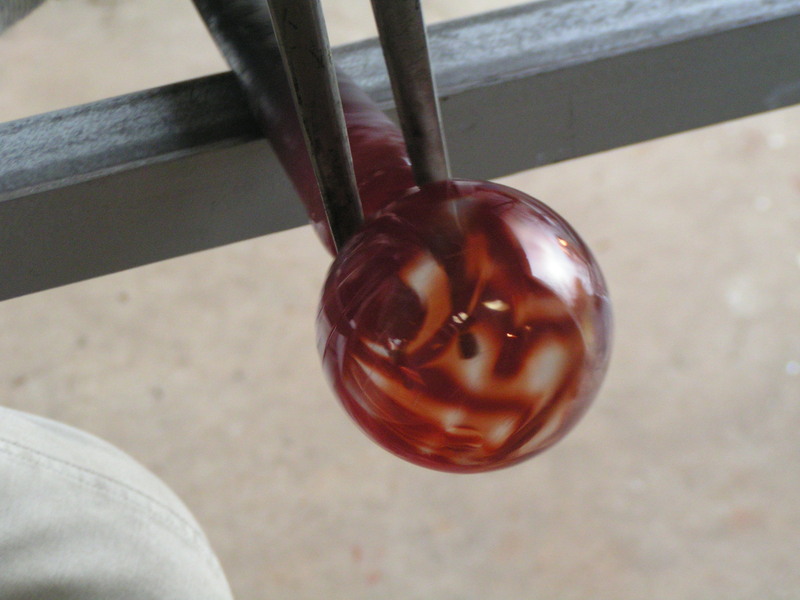 When a glass piece is really hot, everything looks Orange! You can see the ornament is now rather transparent (you can see the metal jacks through it). 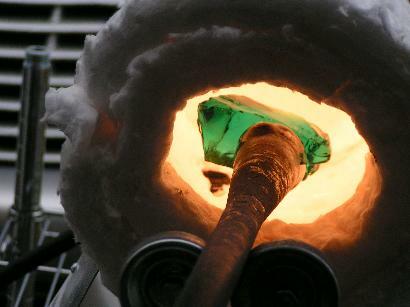 The ornament is now ready to break off from the blowpipe. 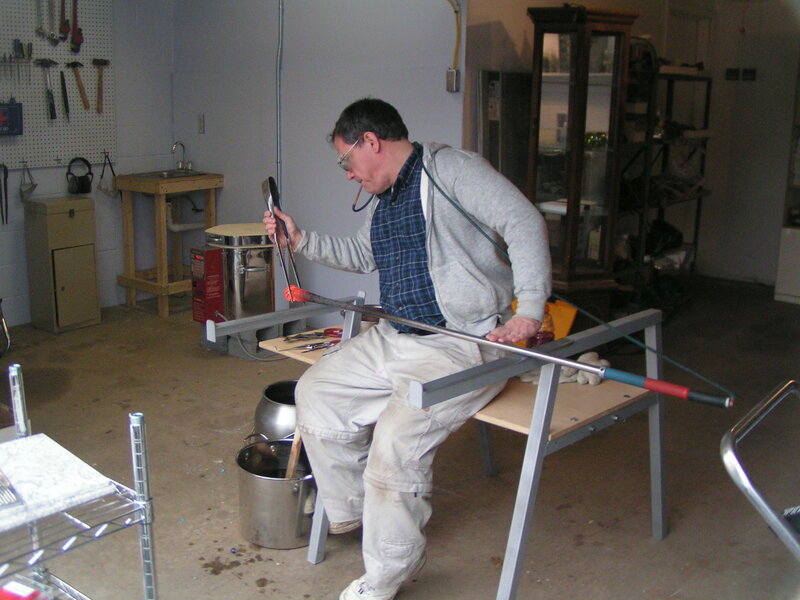 I do this by chilling the jack line with the jacks, and then tapping the blow pipe with either the side of the jacks, or a piece of wood (a "bonker"). After breaking off the ornament, I like to fire-polish the opening with a MAPP gas torch. This takes only a few seconds. I then put on a pair of protective gloves (from a "Silver" proximity suit), and pick up the ornament with a insulated tongs (I purchased on ebay). I keep one hand underneath the ornament, to make sure it will not fall on the concrete floor. 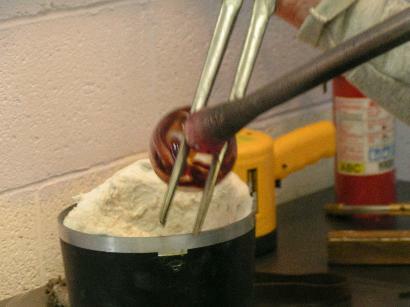 Here I am placing the ornament into my little annealing oven (kiln), while wearing the protective gloves (since the oven is at 950F). Here is a photo of the inside of the annealing oven, after it has cooled down, the next day, with the ornaments I made the prior afternoon. There are still a few pieces of cullet left on the one side. 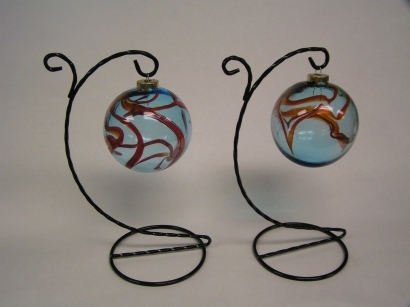 And here are two complimentary light-blue ornaments with orange raked/feathered cane stripes. 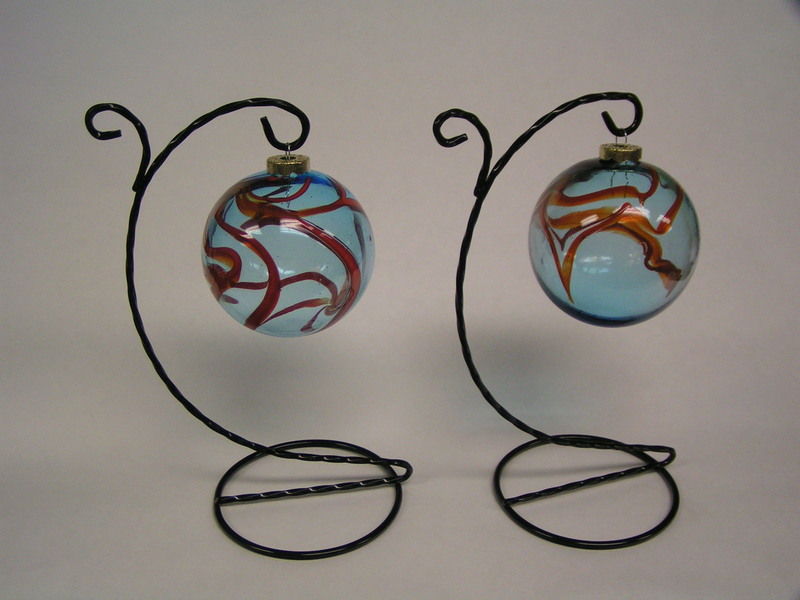 Several people have asked where I purchased the metal ornament tops. Please tell me what you think about making ornaments with a fire bucket!